It has been a dismal year for AT&T (T) investors. While the dividends kept rolling in like clockwork, the rest of the business performed nothing close to Swiss clockwork, and as a result, the stock tanked up to 25% before making up some lost ground at the end of November but has since then continued to exhibit unusually high volatility. AT&T has a stellar and long-term dividend track record, and while recent increases have only come in the 2% region, the stock remains a cornerstone of many long-term dividend and retirement portfolios. As expected, AT&T followed its previous pattern of a conservative $0.04 per share dividend increases putting the dividend at $2.04. Over the past few weeks two of Wall Street’s biggest banks have upgraded AT&T with Citi going to buy and a $34 target price and J.P. Morgan overweighting the stock with a juicy $38 price target. Although this has lead to an initial daily 1-2% gain, the “sell-any-rally-no-matter-how-small” pattern with AT&T continues. AT&T has recently outlined its 2019 expectations predicting very strong cash flow, substantial debt reduction and the launch of a new streaming service. Potentially, the upcoming dividend hike can help establish some degree of optimism with investors. 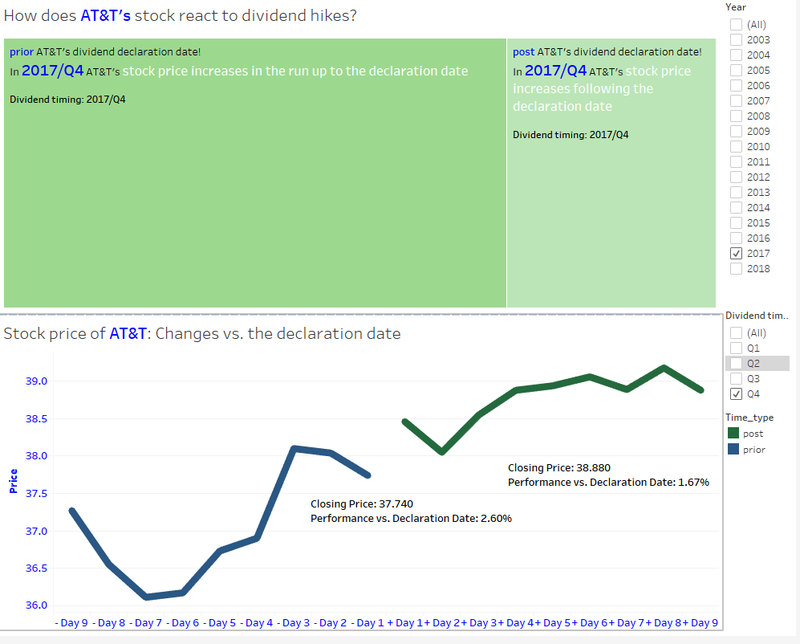 This article now analyzes how AT&T’s stock has reacted in the past to these dividend hikes. Are we observing investors buying the stock in the run-up to the declaration date? Are we observing people buying the stock after the dividend hike? Let’s find out! How Do Dividend Increases Impact AT&T’s Stock Price? With AT&T raising its dividend like clockwork every year before Christmas, we can expect that the market is aware of this. Thus, any patterns we find are not just anecdotal evidence but proven by back-testing analysis. Let’s run through what this means by focusing on the dividend declaration in 2017, which has the “FOCUS!” label attached to it as well as the part highlighted in green and yellow. This was an exceptionally strong period for AT&T’s stock price and very few expected what happened in 2018 to the stock. Could we see the reversal this year? In Figure II we can see that in the lower section the performance in the Q4 cluster following the dividend declaration clearly outperforms those of the other three. This certainly implies that the dividend increases in Q4 have a meaningful and relevant impact on the stock price, even though this pattern does not repeat every single year. 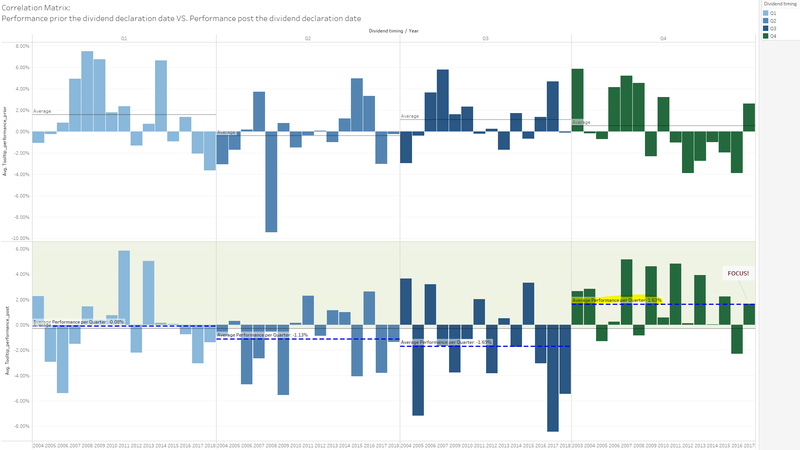 Also, this only reflects performance of the 9 days following the dividend declaration but does not disclose even higher highs within these 9 days. This is where Figure III comes in handy. 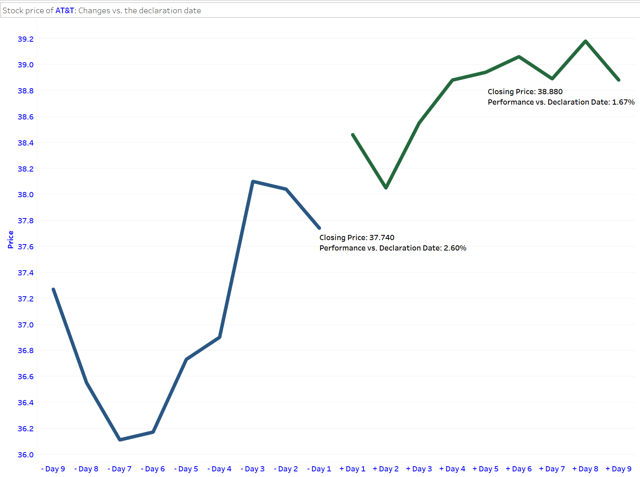 For the most recent dividend increase the stock reacted very favorably and consistently over the next days and surprisingly already rose strongly into the expected dividend declaration date. So now that we know what this is all about, let’s explore whether it is a good idea to buy AT&T in anticipation of a dividend hike or better wait once it has been announced. Or does the stock rather stay flat in anticipation and following those announcements? 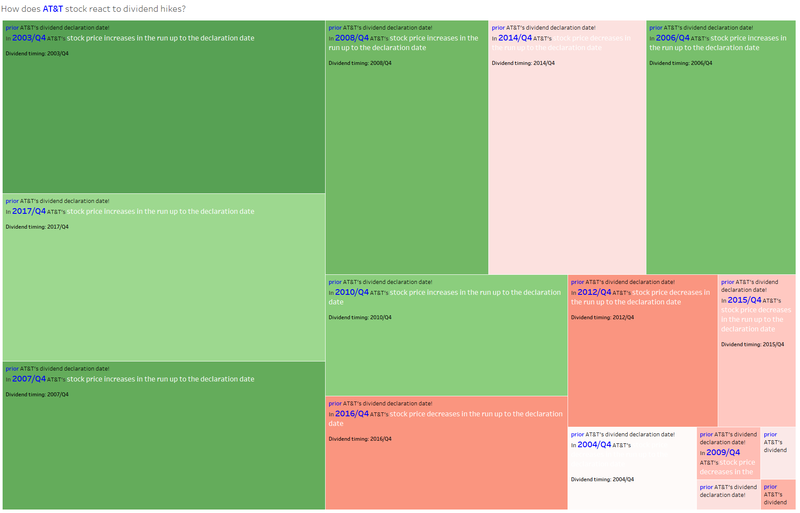 As regards the stock’s reaction to the dividend increase that tree-map easily shows that there are far more green than red squares with the size of the square indicating the overall performance. Over the 15-year time horizon, AT&T’s stock rose in 12 out of 15 years post the declaration date. It rose in 6 out of 15 into the declaration date but only in three years throughout both periods (2003, 2007 and 2017). 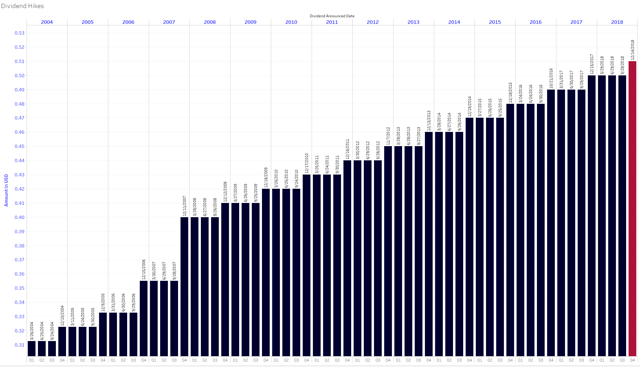 As a result, we can observe a clear trend that investors start flocking into the stock once this heavyweight and super reliable dividend payer has raised its dividend as it does year after year after year. This behavior is also evident in the correlation map shown in Figure II. Combining these more detailed findings with the quarterly overview shown in Figure II we can conclude that the distinct behavior that the stock rises post the dividend declaration can only be observed in Q4 throughout all those years and only randomly during the other quarters. 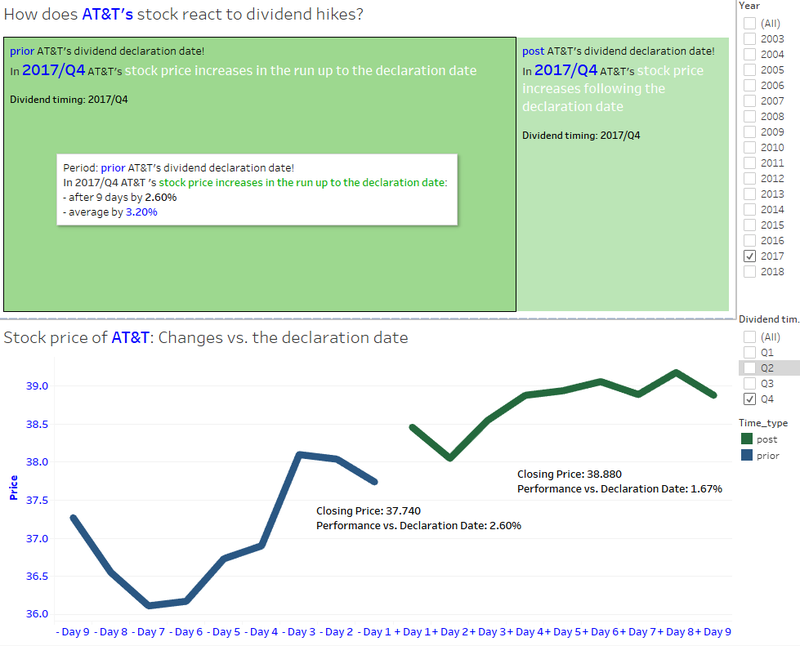 I am not speculating on the reasons but the initial thinking that for a company like AT&T which always raises its dividend in December by a fraction it shouldn’t have any influence on the impact but in fact it more often than not has provided all other factors like general market sentiment remain equal. This is an omnipresent assumption in all kinds of statistical analysis where we try to infer the future from movements in the past and by no means guarantees that it will be the same this year. Still, it may be another relevant point to consider for investors when buying into AT&T now. 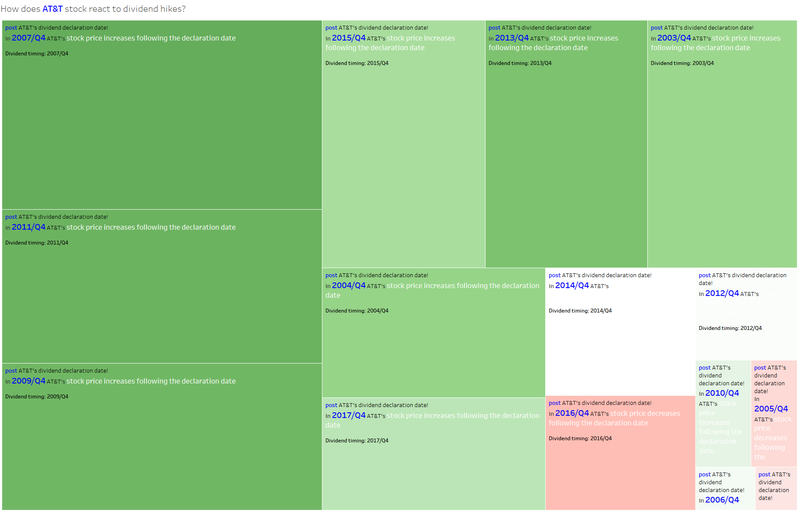 Finally, to bring it all together and allow for individual analysis, I have built a dashboard that you can interact with. This allows you to select different years and find out how AT&T’s stock price reacted to its dividend increases, respectively. All you have to do here is to simply select a year on the right and then hover with your mouse over the data for further descriptions. AT&T is my largest position, and as such, I am constantly eyeing the stock for further investment opportunities. I was shocked that AT&T almost declined to a 7% yield but also delighted to be able to buy more at these generous prices. After a dismal 2018, it seems logical that 2019 will be better but only if AT&T delivers on its cash flow generation, pays down debt substantially and ultimately limits the impact from the erosion of its traditional TV business. 2019 will be the decisive year to gauge whether its business transformation and strategy can succeed. That said, 2020 when the all-new streaming service will be fully in place will be big as well. For 2019, though, I have outlined three main topics that will shape AT&T’s financial year and thus also how its stock performs. Historic analysis has shown the stock is expected to trend upwards now that AT&T has raised its dividend yet again. A current yield of 6.8% beats the broad market by a mile and should be considered one of the safest bets in this yield segment in the entire market. I am also patiently waiting for January, precisely January 9, 2019, when the stock will go ex-dividend as well as its Q4/2018 earnings release around the same time. Here I will likely buy even more following the regular ex-dividend date drop. This strategy does not consider AT&T’s underlying business model and business performance and is assuming the historic ceterus paribus conditions will be applicable to the future as well. Investors may take further aspects into consideration before making a decision.